In South Texas, trace evidence of the presence of Spaniards as early as 1520. The Town of Peñitas, which is located right on the Rio Grande about 13 miles west of McAllen, Texas in southwestern Hidalgo County and around its nearby port of Brazos Santiago on Brazos Island on the Texas coast close to the mouth of the Rio Grande. 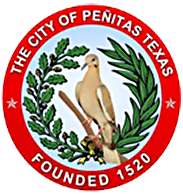 According to local tradition, the Town of Peñitas was founded by one Fray Zamora and five Spanish officers, and their slaves, who were survivors of the Panfilo de Narvaez expedition and shipwreck of 1520. The expedition was formed to arrest the conqueror of Mexico, Hernando Cortez, who was accused of treason against the King of Spain. The expedition failed after Narvaez and his men were defeated in battle and imprisoned by Cortez. According to the tradition, which has been passed down by the inhabitants of this little town, Fray Zamora and the five officers befriended the local Calero Indians and settled in the site founding the town of Peñitas, which means “little stones.” The Spaniards built stone houses to live in, as opposed to the Indians’ thatched huts, and sometime after, Fray Zamora, with four companions, traveled south to Mexico City to secure a proper title to the land. So was founded the town of Peñitas. Present day, there exists a historical marker That U.S Congressman Kika De La Garza dedicated in the site of Peñitas which indicates that the tiny village has been continuously inhabited by descendants of those first Spaniards since its founding in 1520. By 1850, Peñitas had several ranches located within boundaries and by 1904, the St. Louis, Brownsville, and Mexico Railways had reached the town. The population of Peñitas totaled to approximately 100 people from 1925 to 1948. During the 1950s, the population peaked at approximately 300 people before slowly decreasing in the 1960s. By 1992, the town had estimated population of 1,077, which increased slightly to 1,167 in 2000. In 2010, the population had increased exponentially to an estimated 4,400 people. With a recent annexation in 2013, the total population is currently estimated to be 7,500.